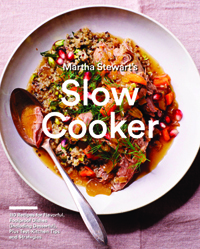 In her book, Martha Stewart’s Slow Cooker, the Grand Dame of homemaking elevates slow cooking to special occasion-worthy. The secret is putting in a little more fuss and muss – or prep and panache as Stewart says. Saute vegetables before adding to cooker to bring out caramelized flavour. Brown meat before adding to cooker to seal in moisture for tender results. Add only enough liquid to reach but not cover ingredients. Use the freshest spices and herbs and avoid packaged seasoning. Finish dishes with fresh garnish including herbs – and lemon in the case of fish. And don’t be afraid to – and, in fact, do – lift the lid on occasion to keep an eye on things and give a stir if necessary. It’s a good thing – Martha says so. Here, recipes that are sure to be a crowd-pleaser! The slow cooker’s value has as much to do with what it doesn’t do as with what it does. In the case of fish, that means not overcooking it. It’s a com­fort to know you can poach a whole fillet without the risk of drying it out. Place wine, water, shallot, thyme, bay leaf, garlic, celery, carrot, lemon and peppercorns in the slow cooker. Cover and cook on high for 30 minutes (or on low for 1 hour). Check for pin bones in the salmon by running your fingers over the fillets; remove any stray bones with tweezers. Season salmon with salt and pepper, and transfer to slow cooker with poaching liquid. Cover and cook on low until salmon is opaque and flakes easily with a fork, about 1 hour (we prefer the texture of the fish when cooked on low rather than high). For more well-done salmon, continue checking every 15 minutes until fish reaches desired doneness. (Salmon is well done when an instant-read ther­mometer placed in the thickest part of the fillet reads 145°F.) 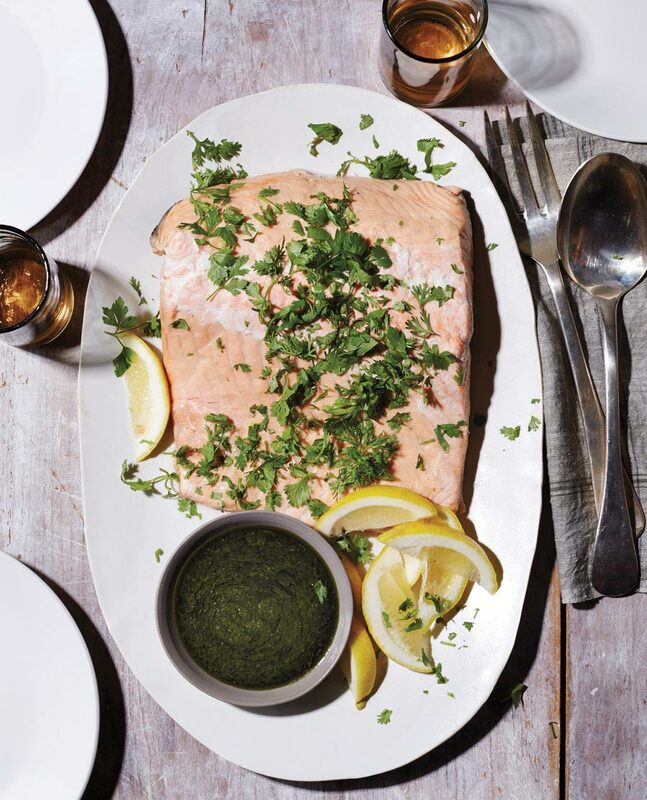 Serve warm or at room tempera­ture with Salsa Verde. Salsa Verde: In a food processor or blender, pulse 2 cups fresh cilantro leaves, 1 cup fresh flat-leaf parsley, ½ cup extra-virgin olive oil, 3 tablespoons fresh lemon juice, 1 large garlic clove, ½ teaspoon coarse salt, and ¼ teaspoon freshly ground pepper until smooth. Serve immediately. When cooked, the salmon will be delicate. Line the slow cooker with parchment paper large enough to extend over the top of the pot for easy removal. This may just become your new favourite breakfast, since the oats cook to the ideal texture while you sleep. They also take well to any number of toppings, savory or sweet. 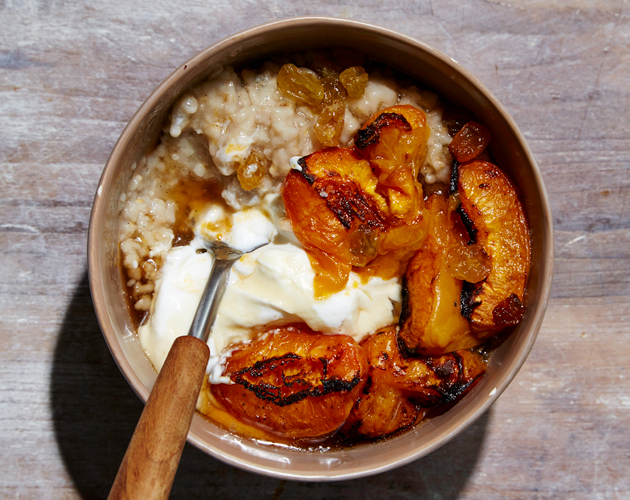 Swirl Greek yogurt into the oats, top with roasted apricots and golden raisins; then drizzle with maple syrup. For savory oatmeal, omit the vanilla bean and sugar. Preheat a 5-to 6-quart slow cooker. Combine oats, boiling water, sugar, vanilla bean and seeds, and salt in the slow cooker. Cover and cook on low for 8 hours (or on high for 4 hours). Remove and discard vanilla bean before serving. Roasted Apricots: Preheat oven to 350°F. In a roasting dish, place 8 halved pitted apricots with 4 tbsp unsalted butter, ¼ cup raw sugar, and 1 tsp Grand Marnier. Roast until apricots are tender, about 30 minutes. Instead of cooking the oats in water, you can use a mixture of half milk and half water, or a cow’s-milk alternative such as almond or coconut milk. 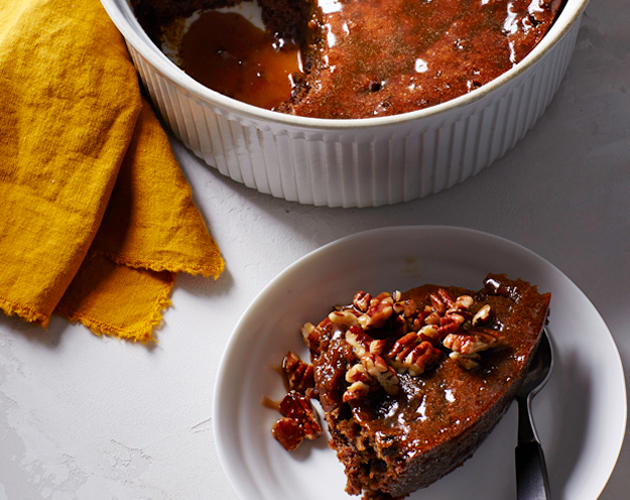 Sweet dreams are truly made of this – our kitchen team’s favorite slow-cooker dessert. Using a water bath (or bain-marie) produces the dreamiest texture – not too dense and not too light. Don’t skimp on the toffee-sauce-and-pecan finish. If your slow cooker cannot accommodate a soufflé dish, try baking this in ramekins. Make pudding: Butter a 2½-quart soufflé dish. In a small bowl, dissolve espresso in 1 cup boiling water. Add dates and let soak 15 minutes. Stir in baking soda and vanilla. Whisk together flour, baking powder, salt, cinnamon and nutmeg. In another bowl, whisk brown sugar, melted butter and eggs. Whisk sugar mixture into flour mixture until well com­bined. Fold in date mixture until just combined. Pour batter into prepared dish, cover with parchment, then cover tightly with aluminum foil. Place dish in a 5- to 6-quart slow cooker. Pour enough boiling water to reach three-quarters up the sides of soufflé dish. Cover and cook on high until cake is set and a tester inserted in center comes out clean, about 2 hours (or on low for 4 hours). Transfer dish to a wire rack to cool slightly. Make sauce: In a saucepan over low, heat butter, brown sugar and cream until butter is melted. Bring to a boil and cook, stirring, until sauce is thick enough to coat the back of a wooden spoon, 3 to 4 minutes. Poke holes in cake with a skewer and pour half the toffee sauce over cake. Let cake absorb some sauce. Spread sauce around evenly to soak into cake. Stir pecans into remaining sauce and serve on the side. Cake is best served warm.